Late clematis (Clematis spp. 3): growing, planting, caring. This is a description for late-flowering clematis cultivars-- "group 1" - that bloom from July to September. Clematis are great climbers, with sometimes deciduous foliage, which means that in the winter their leaves and their stems dry. They get into dormancy, and when spring comes, they produce new stems at a breathtaking rate, and then leaves and flowers, in search of anything to hang on to! Clematis are a genus in the Ranunculaceae family, which includes approximately 30 species of woody, herbaceous perennials, as well as a number of semi-woody, climbing plants that may be deciduous or evergreen. They're cultivated for their abundant, decorative blooms! There are more than 40 cultivars, and due to the diversity of species, the appearance of clematis' varies considerably. 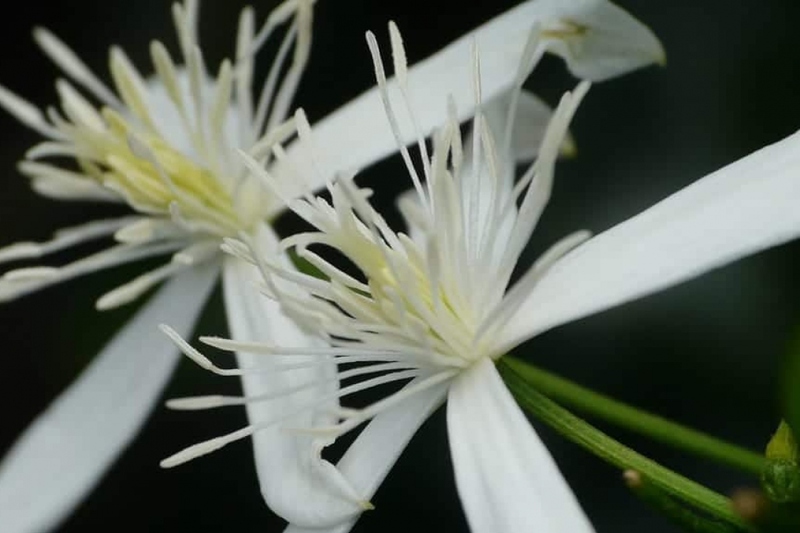 Groww distinguishes 3 types of clematis, mainly according to the type of size to be made: this description concerns the clematis with late flowering, called "group 3", blooming from July to September on the wood of the same year. The clematis appreciate to have its head in the sun and its foot in the shade, facing South or West. Plant in late autumn or winter, in unfrozen soil, during the dormancy of the plant. Plant in a hole at least twice as big as the root ball. Soak the roots in water before planting, it should improve the chances of recovery. Keep a hollow around the base, it will serve as a water reserve during the first months. Tamp the soil well around the roots (do not hesitate to use all your bodyweight). Water until the hollow is full, and the level decreases very slowly (at least two watering cans). Clematis prefers to have shade at their base, shelter it with a flat tile Also cover the base with a small mound of soil, which will promote the emission of shoots from the stump. Provide the clematis with a small support pole to bring it to its final support. Clematis easily reaches 5 m despite a regular trimming, so use a sturdy support. Trim a third the stems at 20-30 cm above ground at the end of winter. Water twice a week in the first month if you have planted your clematis late in the season. When watering climbing plants, it's better to carry out generous but infrequent watering to encourage the root system to seek water deep underground. It's therefore suitable to water until the planting basin is full and only empties slowly. If the new stems aren't twisting and attaching to the support by themselves or if the plant "collapses", rehang them. Mulch climbers to limit weed competition and evaporation. A layer of 5-10cm mulch of bark or wood is recommended. In February, mulch the clematis with compost or well decomposed manure, before the spring shoot. Bury it by a slight digging or distribute it in small holes dug not very far from the roots.